Talk about a humbling week. Last week I was making the case that 3.11% on the 10-year Treasury note yield and possibly as high as 3.16% were the key levels that I did not think would be breached. This chart shows how wrong I was. Yields shot up 18 basis points in three days to blow through the key resistance levels. 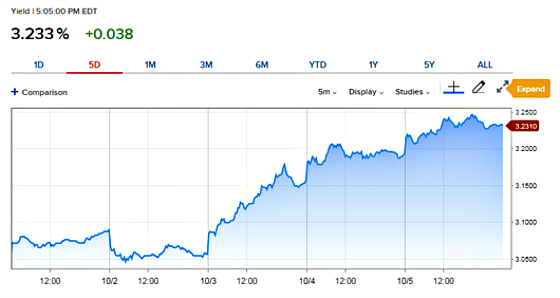 Eventually, this spilled over to the stock market as Thursday and Friday were ugly days. According to sentimentrader.com, on October 4th when the S&P 500 was within 1% of its high, 14% of all stocks on the NYSE hit 52-week lows. Go figure. My cautious optimism that rates would not do what they did was related to two factors. The first related to how yields dropped pretty significantly after hitting 3.10% the previous week and the second was because I thought higher rates would impact economic output. For example, housing is clearly struggling now and rates have gone up which makes homes less affordable. It was already challenging for people to get into homes that are going up in value as a result of too little supply being created and higher construction costs. The following chart shows mortgage rates and the Case-Shiller home price index. You can see how home prices have been on a relentless trend higher since bottoming in 2012 while mortgage rates were generally on a downtrend until 2017 and now they have been climbing higher for almost two years. This is a recipe for a slowdown. Private construction spending growth is definitely slowing and higher rates will not be supportive in reversing this trend. I have also been taking comfort in the yield curve continues to narrow which had been the case since late 2016… until it spiked higher this past week. The market seems to be pricing in a bit more growth via higher real rates and a more aggressive Fed. 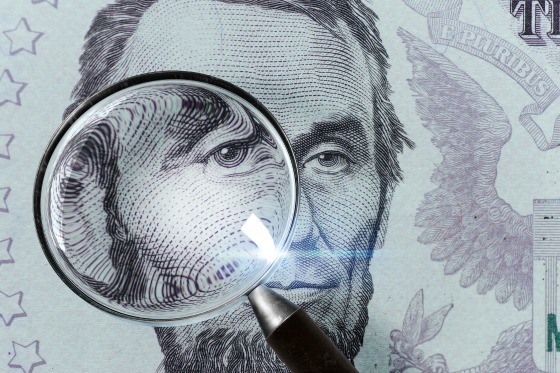 Previously the market seemed to be ignoring a more hawkish Fed on the long end of the curve in that it believed that the Fed would tighten too much and slow the economy and keep long-term rates from moving higher. Last week brought this hypothesis into question. So where do we go from here? Rates are up about 46 basis points from the recent bottom on May 29th at 2.77%. Now that 3.11% has been breached, the previous high was 3.65% on February 9th, 2011 so that is the next threshold to pay attention to. 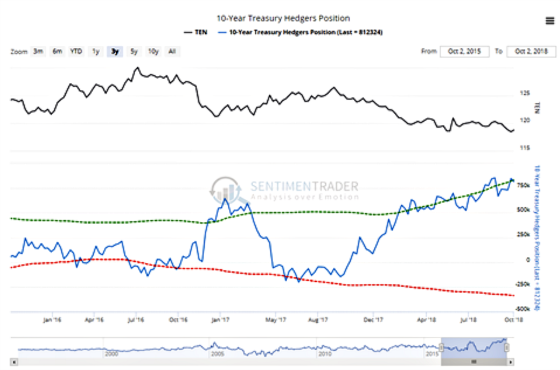 The next chart shows how hedgers have become increasingly long Treasuries (betting on rates going lower) and have been losing as the speculative shorts have been cleaning up. This has led to a self-reinforcing momentum cycle as hedge funds and other speculators keep piling on to bet against Treasuries as rates have climbed higher which has helped keep rates going higher. Eventually, something is going to give and the hedge funds and other shorter-horizon speculators will have to unwind their shorts by buying Treasury futures and/or underlying Treasuries which should bring rates down over time. So far I have been wrong about this. Start of a panic. On Thursday, more than 1.5 million put options were traded on 10-year and 30-year Treasuries. That’s the most since at least 1999. It’s starting to finally drive up the put/call ratios on those bonds. The latest Commitments of Traders report was released, covering positions through Tuesday. The 3-Year Min/Max Screen shows that “smart money” hedgers moved to yet another multi-year long position in gold and long-term Treasuries while adding to massive short exposure to unleaded gas. The Backtest Engine shows that the last two times hedgers held more than 15% of long-term Treasuries net long, the contract rose more than 4% over the next three months (not as bullish before that). ‹ What ‘The Eleven’ Has to Do With Interest Rates?